BBQ spareribs are not difficult to make if you know some basic rib cooking techniques. The key is to foil your ribs so they stay tender and moist. I find that ribs cooked without foiling tend to be dryer. If you follow my steps below and allow the crust to set before you foil, you will get consistently excellent results. Remove membrane from bone side of ribs. 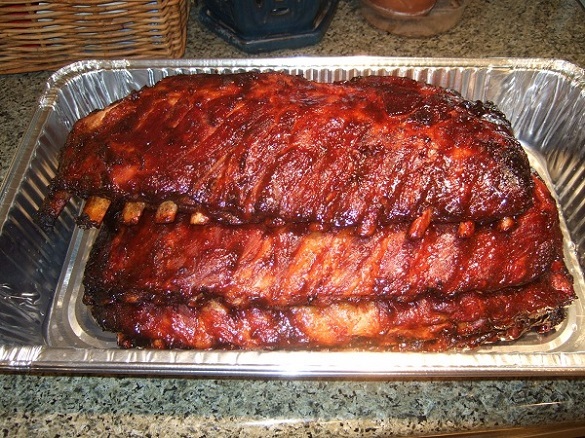 Place ribs on aluminum foil pan and pat dry with paper towels. Sprinkle both sides evenly with the SYD Rib Rub; about 2 tbsp of rub for each side. Let rest in refrigerator for 1 hour for rub to “sweat” into meat. Place ribs meat side up into 275 – 300 degree smoker with some hickory wood chips. After two hours and when crust has formed, remove from smoker and place meat side up on a sheet of aluminum foil. Sprinkle an even thin layer of brown sugar on meat. Drizzle honey next. Flip over so bone side is up. Repeat the brown sugar and honey step. Put 2 tbsp of apple juice at the bottom of the foil before folding the ribs up into a airtight pouch. Return to smoker and cook for another 1 ½ hours. After 3 ½ hours total cook time, unwrap the foil and check the ribs for doneness. Use a toothpick and poke the meat between the bones. If the toothpick slides in easily, the ribs are done. You can also tell it’s done when the meat pulls away about ½ inch from the ends of the bones. If not yet done, close the foil, return to smoker, and check back in 10 minutes. Repeat until ribs are done. Be patient while they tenderize. When done, remove from foil and paint on a thin layer of your favorite BBQ sauce. Return to smoker for 10 minutes for sauce to set. Great looking ribs! Noticed that in your recipe for Baby Back Ribs with Agave Glaze, you spritz the ribs after 90 minutes until the bark sets and then foil. Here for your recipe for spare ribs, you skip the spritzing – any reason for the difference? Harry – After reading your recipe for St Louis style ribs, and after having great results with your Baby Back recipe, I was wondering the same thing as dhoffm99…. why don’t you spritz? You can spritz when you cook BBQ. Sometimes I don’t and sometimes I do. You gotta do what feels right by looking at the meat. If it’s drying out too fast, I spray. If not, I don’t. Cook by feel, sight, and experience and you’ll get a great result! That sounds like reasonable advice… thanks! Thanks for the recipe, I followed this yesterday with 2 slabs of St Louis ribs, they turned out excellent. I received wonderful compliments. The total cooking time was only 4 hours, not 6 as I have spent in the past, yet the ribs turned out as tender and flavorful as ever. Thanks for all of the advice. What is your opinion on metal rib racks? Will the ribs cook much differently in a vertical orientation? I need to maximize space for a larger gathering and am considering a few racks. how do you fit those on the WSM 18.5? Looks great. I use a Weber Smokey Mountain – as you recommended on Amazon. I assume you don’t use any water in the water pan at all during the smoke? What rack do you recommend to cook ribs on with the 18" WSM? Thanks for sharing this! Can this method and recipe be used for baby back ribs as well or is it specific to spare ribs? You can also try this recipe for baby backs. Harry do you smoke these dry with an empty pan or with water in it? I will be doing mine on a wsm 22 as well. Thank you for sharing. My water pan is dry and wrapped in foil. I add water via a spray bottle to set the crust and to set the smoke ring. Good luck!